Wookey Hole Witch - £50k salary, a new 'best job in the world'? UK tourist attraction Wookey Hole Caves have launched a campaign to find a new 'Wookey Hole Witch' with a salary of £50,000 on offer. Following the formula of Hamilton Island's 'Best Job In The World' campaign, Wookey Hole have placed ads in local job centres and newspaper classified sections - and the ad wording is clearly designed to stimulate Conversation and raise awareness of the Wookey Hole attraction at the same time. "There are a lot of disgruntled witches living around the country. Wearing pointy black hats and black hessian drapes they’re reduced to casting spells whilst sitting on a sofa in front of a 38” flat-screen TV in a suburban semi, using own-brand potion ingredients sourced from the local Sainsburys. Not the des res, executive, no mod-cons, wind-swept blasted heath of their dreams. For one lucky witch though, these ancient yearnings could soon be fulfilled. 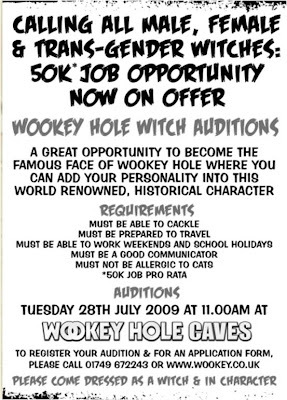 There’s a unique job on offer at Wookey Hole in Somerset. It’s a job which comes with witch-perfect live-in accommodation in a spacious cave, and a 50K salary. £50,000. Enough to buy designer-label rags, frogs from Fortnum and Mason’s and a Le Creuset cooking pot." The successful applicant will be expected to "go about her everyday business as a hag, so that people passing through the caves can get a sense of what the place was like in the Dark Ages. This was when an old woman lived in the caves with some goats and a dog, causing a variety of social ills including crop failures and disease. She also turned the local milk rancid." A salary of £50,000 is offered to the successful candidate and the interview process consists of "on-site assessment incorporating a range or standard tasks, [which] will take place on Tuesday 28th July at 11am. Wookey Hole has decided to run the process on an “open audition” basis. Ambitious witches, looking for a key career move, should turn up dressed for work and bring any essential witch accoutrements." Another aspect that will drive conversation is the headline "Calling all male, female and Trans-gender witches" as well as the comment that "The authorities hope that Wookey Hole will employ a trans-gender witch, preferably recruited via a youth training initiative." However, the Wookey Hole Witch campaign is another example of how The Conversation can be stimulated in order to amplify a message and increase Buzz / Word Of Mouth awareness. As a pagan and a witch I am not particularly thin skinned I grit my teeth every Halloween as my kind get made into childrens nightmares or party themes (something that doesn't happen with other religions without an outcry or the threat to kill the perpetrator) but this advert is pretty offensive – can you imagine asking for an audition for convincing show Muslims – to grovel around on the floor for the audience or maybe an authentic Christian to regularly practice ritual cannibalism on weekends and school holidays. How come the local council cares what gender is offered the job but not that the job is a nasty, bigoted one in the first place? Interesting point of view and one that I admittedly hadn't taken into account when I wrote the post. The Australia best job in the world just offered a great job (with certain strings attached.). The Wookey Hole Witch could be perceived as trivialising Paganism / those who genuinely hold these beliefs. The stunt clearly gets mainstream coverage and raises awareness of the attraction amongst the public at large but not without potentially alienating the community whose beliefs they aim to highlight. Interesting to see what the actual response is and the quality of applicant they attract.